For royal brides, “something borrowed” tends to be something encrusted with diamonds, and Princess Eugenie’s wedding tiara was no exception. Queen Elizabeth II, the princess' grandmother, lent her a stunning diamond and emerald headpiece for her wedding to Jack Brooksbank on Friday at St. George’s Chapel in Windsor Castle, England. Princess Eugenie’s tiara choice surprised many royal watchers who had predicted she would wear the York Diamond Tiara — the one her mother, Sarah, Duchess of York, wore on her own wedding day in 1986. The bride took a less expected route when she chose the Greville Emerald Kokoshnik Tiara, which is seldom worn publicly by members of the royal family. The Greville tiara was created by the Parisian jewelry house Boucheron for Dame Margaret Greville in 1919. Greville, a socialite who was close with the royal family, left the tiara to the Queen Mother (then known as Queen Elizabeth) when she died in 1942. When the Queen Mother passed away in 2002, the tiara was passed down to her daughter, Queen Elizabeth II. The tiara is set with brilliant and rose cut diamonds. A large emerald stone is at its center with six emeralds spaced on either side. 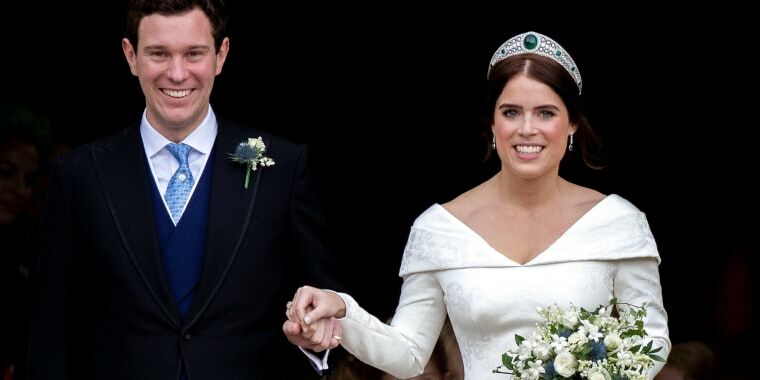 Princess Eugenie wore the Greville tiara without a veil, an unusual choice for royal brides. Royal family officials did not reveal the reason for that particular style choice, but it’s possibly because she wanted to leave her back exposed. The bride had said she intended to celebrate her scars from a back surgery she had at age 12 to correct scoliosis. “A veil would have obscured that deliberate design detail," royal jewelry expert Ella Kay noted on her blog, The Court Jeweller. Princess Eugenie was the latest royal bride to borrow a tiara from the queen for her nuptials. Meghan, Duchess of Sussex, borrowed a diamond-encrusted bandeau tiara from Queen Elizabeth for her wedding to Prince Harry in May. And Catherine, Duchess of Cambridge, borrowed the queen’s Cartier Halo tiara for her wedding to Prince William in 2011. Princess Eugenie’s choice of tiara may have come as a surprise, but her sparkly headpiece couldn’t have been more stunning!